Site preparation is always the first phase of any major construction or forestry project. This process involves clearing the land of trees and debris, leveling the ground for building, and moving materials to and from the site. The process of site preparation is unique to each project, and as such, the necessary steps and equipment will vary. 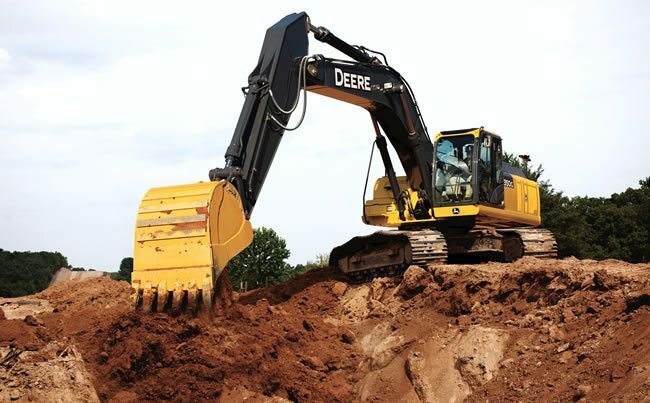 However, most of these projects make use of a few key pieces of equipment common to the worksite; read on for more details about these important workhorses, including excavators and skid steers. First up on our list is the skid steer. They are smaller in body than some of the other pieces of equipment on the construction site or forestry floor, but they offer incredible power and enhanced maneuverability due to their compact size and shape. Skid steers sit lower to the ground, offering machine operators better sight lines which increases safety for everyone on site and improves overall productivity. The flexibility of the skid steer is another reason for its popularity: it can be transformed into a wide range of tools using various attachments. The John Deere skid steer is renowned for its 100+ available attachments that help operators and owners make better use of the machine and save time preparing sites for construction. Articulated dump trucks also provide worksite flexibility and adaptability, but not through the use of attachments. They are all-wheel drive, off-road vehicles that are able to handle the toughest working conditions and most extreme weather imaginable. The dump truck is ideal for difficult terrain due to the design of the cab and dump body, which enables all wheels to remain on the ground during operation. Dump trucks offer enhanced stability, which makes them perfect for the wet and icy conditions of winter that are often battled against in the forestry industry. Excavators are probably the most popular heavy construction equipment found on worksites due to their wide selection of available sizes and styles and attachments that enhance the capabilities of the machine itself. The excavator can be used for material handling, forestry work and mulching, demolition, mining, and snow removal via attachments. Wheel loaders are a type of tractor available in standard and compact varieties/sizes that provide flexibility in multiple work environments, like construction and urban projects that are tight on space. Loaders are known by many names (bucket loader, front loader, front-end loader, payloader, skip loader, shovel, wheel loader) but they all serve one great purpose: these heavy equipment mainstays are used to move or load materials on the worksite. They are often used to transport asphalt, dirt, construction debris, logs, gravel, rock, or sand to a secondary piece of equipment like a dump truck or conveyor belt. A secondary use is to shovel or remove snow from sidewalks, parking lots, and areas too confined for typical snow plows. Finally, we have the backhoe loader. The backhoe loader is often referred to as a digger or backhoe, and is a standard member of the heavy equipment family. The backhoe loader’s small size enhances its versatility and precision, and leads to greater visibility on the job site. Its small stature makes it the perfect piece of equipment for construction work and urban engineering projects where space is limited. The backhoe has many applications, including transportation of building materials, excavation/digging, paving roads, and breaking up asphalt. Like the skid steer, the backhoe loader has many available attachments to enhance productivity. No matter which piece of equipment you choose, these heavy lifters of the forestry and construction world will quickly become indispensable to your fleet. These machines are capable of handling the toughest tasks, the most difficult weather, and the harshest environmental conditions as you prepare your site for construction. Check out our new and used inventory of John Deere and Hitachi construction & forestry equipment available at a location near you in Washington, Oregon, and California. Trust us to keep you moving.